Dinners seem to be directly related to how hard we’ve been working each day. A quick, filling meal for long, tiring days, and more inventive, complex meals when we’ve had more time to consider what’s going to be on the table. 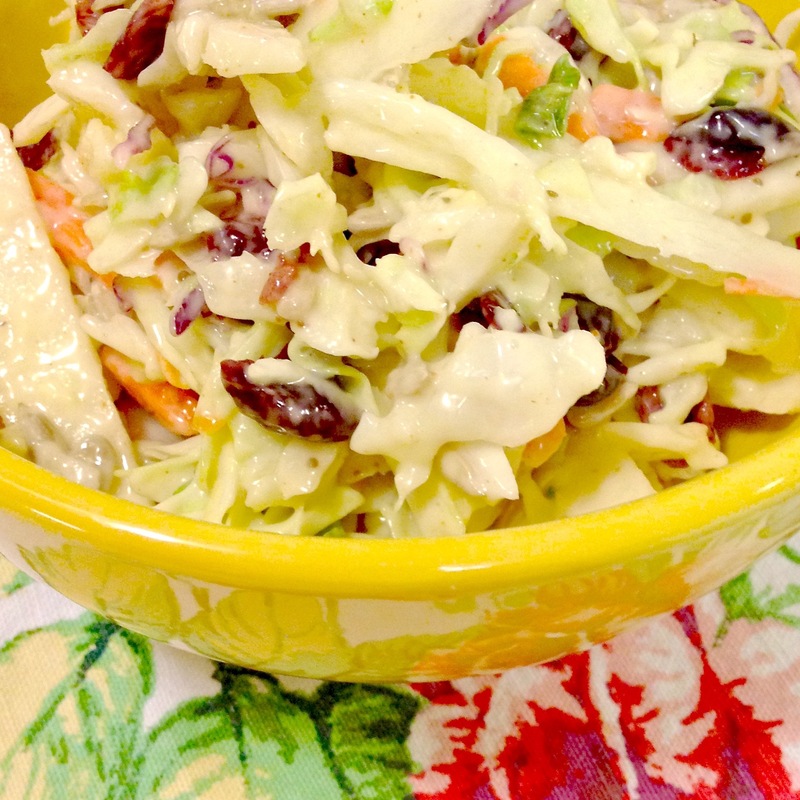 Coleslaw is a quick, filling side dish, that’s easy to prepare, and goes well with hamburgers, grilled meats, pulled pork, and other summer favourites. 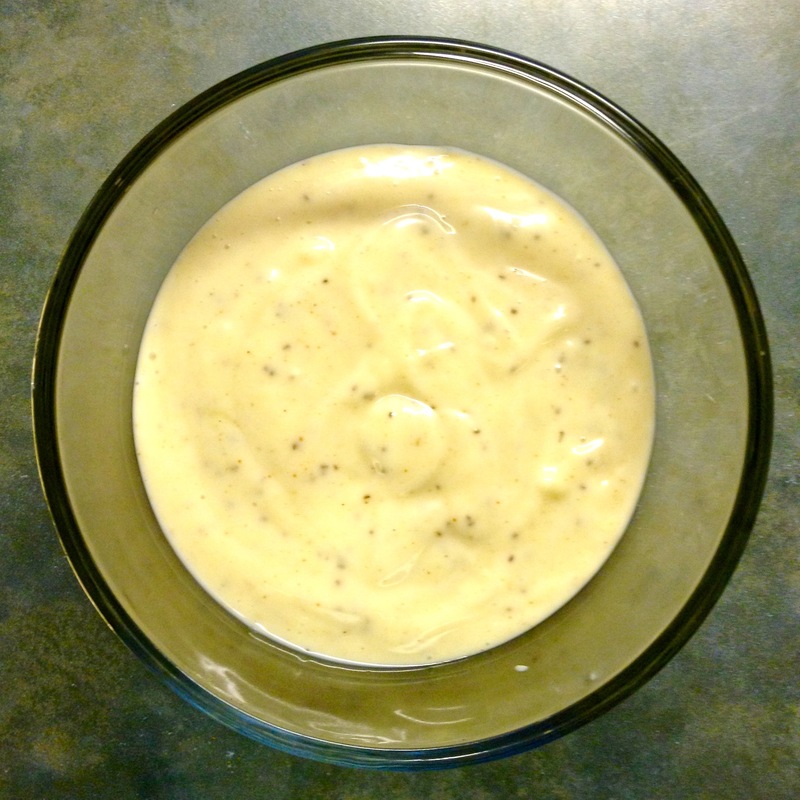 Whisk all of the dressing ingredients in a small bowl. Cover & refrigerate until ready to use. To slice the cabbage, cut the head into quarters, from the top through the stem end. Cut out the heavy core. Starting at the top end, with the cored quarter lying on its side, cross cut in slices no thicker than ¼”. Toss the cabbage together with the grated carrot. Add in the sunflower seeds and dried cranberries. Cut the apple into quarters, core, and thinly slice, leaving the skin on for colour (the photos show peeled apple slices due to my brain muddling over other things apparently). 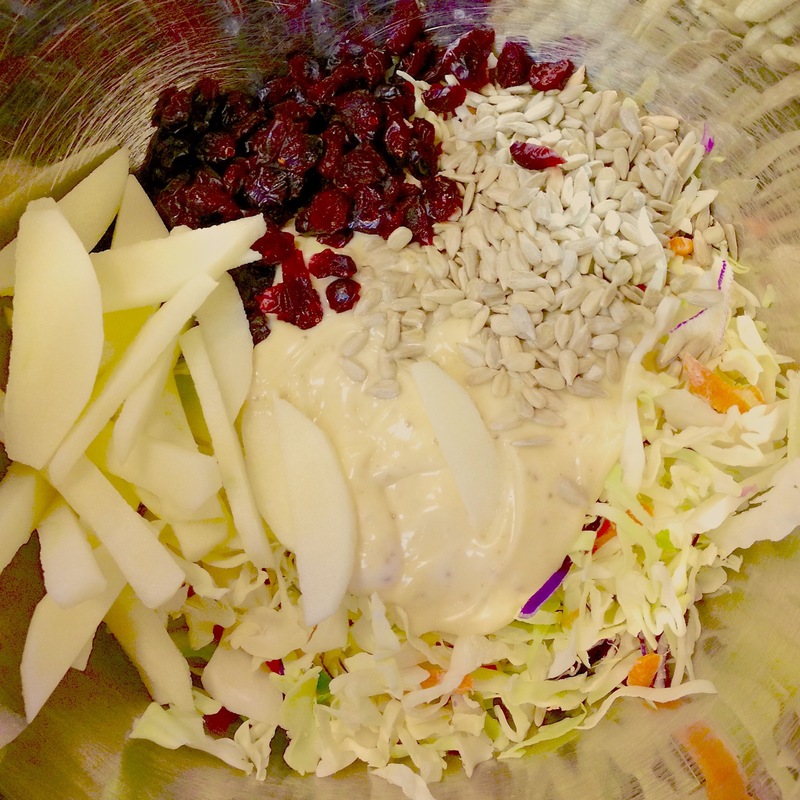 Shown here with the dressing, cranberries, apple and sunflower seeds all sitting on top of the cabbage mixture, ready to be mixed. The better method is to follow how I describe combining the additions in the recipe. Toss with the other ingredients. Pour half the dressing over and toss well. Add in more dressing until everything is lightly coated. Keep chilled until ready to serve, up to 5 hours. 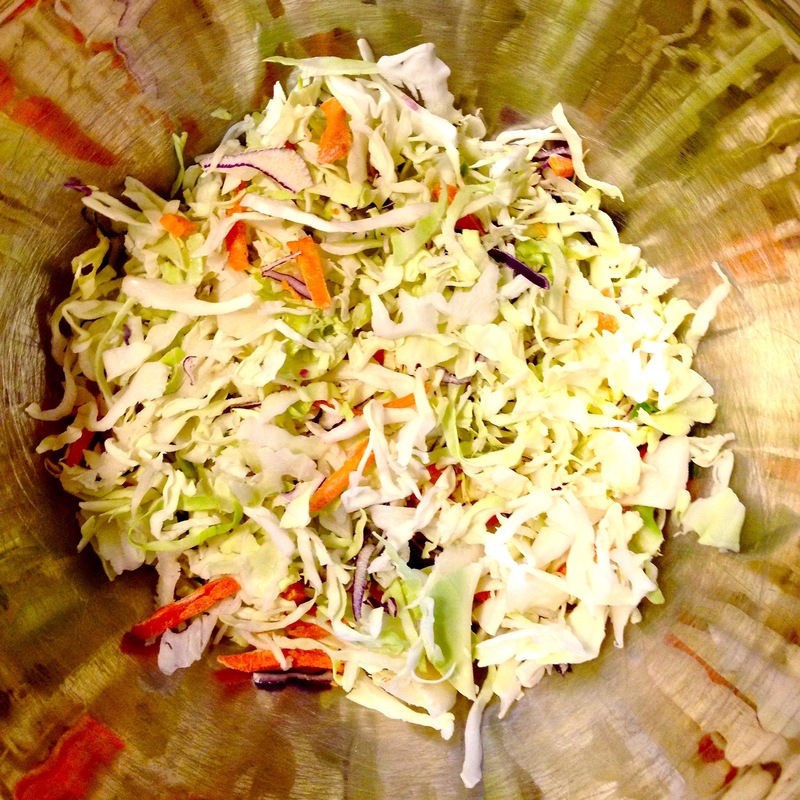 Quick Prep: Use a 1# bag of prepared Coleslaw vegetables in place of the cabbage & carrots. 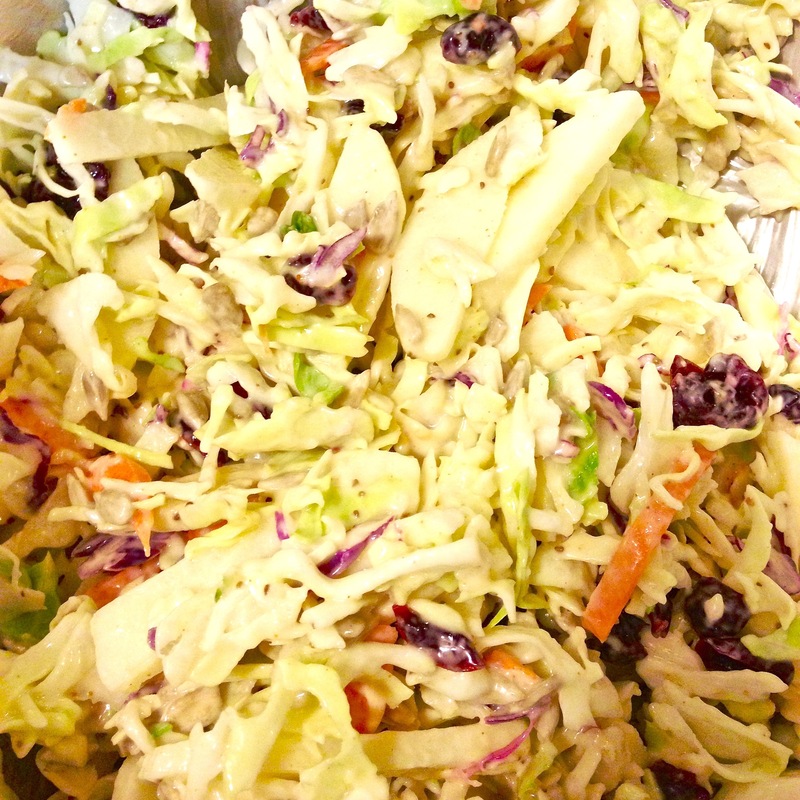 Large Group ~ 1 large head of cabbage (4-5 lbs) and 8 carrots will make enough coleslaw for 30 servings. Just use 1 c sunflower seeds, 1 c dried cranberries, 4 apples, and 4 x the dressing recipe.